The time has come to update your kitchen. As one of the most frequented spaces in your home, the kitchen is a central point for family, guests, and more. Anyone hoping to perform quality renovations without breaking the bank can benefit from working with Detail Design & Remodeling. Our company supplies top-notch cabinet refacing to Atlanta and much of Northern Georgia, creating long-term results that aim to please our clients for years to come. Our home remodeling contractors specialize in custom cabinets and more, delivering renovation solutions that are sure to surpass your high expectations. 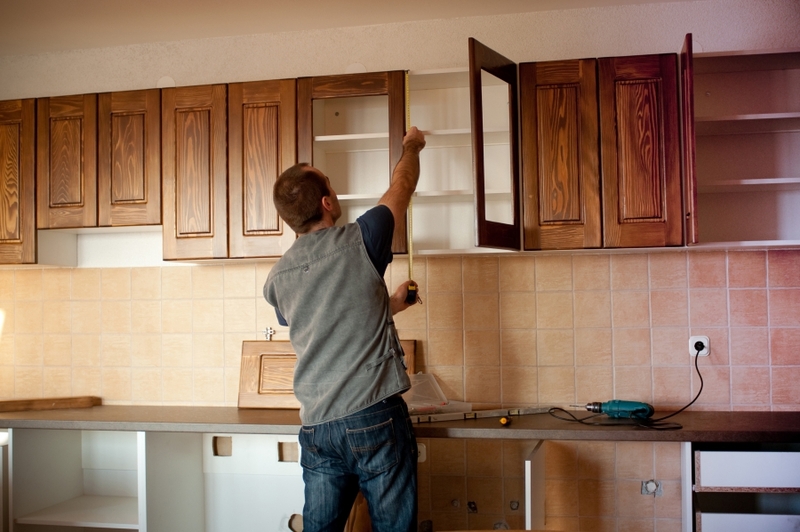 One option for updated your old, outdated cabinets is to simply tear them out for a full replacement. Unfortunately, the cost and intensity of cabinet replacement can make the task unrealistic. 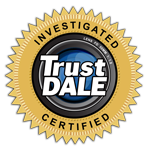 Our services aim to provide an effective middle ground for our loyal customers. To replace or to refinish? This may be the question for your kitchen renovation. Today, we’ll look at the costs and benefits of each service, and compare which choice may be perfect for your home. If you’re unsure if your home is ideal for cabinet refacing, be sure to contact our experts today! A complete tear-down of your kitchen cabinets may be a smart choice. One key advantage here is that you have the freedom to change the layout of your space. Anyone needing to completely revamp their space with a new layout or with increased functionality can benefit from proper planning and full-scale replacements. Whether you have discovered a passion for cooking or your family has grown by two in the past few years, upgrading the kitchen to reflect your needs can be a smart option. The freedom of cabinet replacements comes at a price. Kitchen remodeling can be an intensive process, and the act of moving your cabinets to a new area can result in more complications. Matching the style and color of your kitchen can be a challenge, especially if the renovation is being done in stages. It’s important to plan ahead here, as the last thing you want is to finish the project, only to realize that you are in need of flooring that is now out of stock! Financial costs for this project can be range widely based on the complexity of your kitchen and the material choice for replacements. The combined cost of materials and labor may simply be too much to be feasible for your budget, and we understand! Adding a veneer. Our cabinet veneers aim to provide a high level of aesthetic quality without the high price tag. Whereas other companies offer refacing services with cheap materials, Detail Design strives to use only high-quality wood for each product produced. Painting or staining the existing doors. Your existing material may be ideal for staining or painting to create a fresh new surface. This choice is often very cost-effective and can be done by crafty homeowners. Replacing the doors. Replacing the door in its entirety may prove to be the best choice for your cabinets. This process entails exactly what you’d expect, consisting of a quality wood product to update your kitchen’s style. Cabinet resurfacing or refinishing is a very cost-effective option for multiple reasons. The labor costs and total project time are severely reduced when compared to full replacements. Living with an out-of-commission kitchen can prove to be very inconvenient, and many homeowners would prefer to minimize their lack of kitchen amenities as much as possible. While our refacing services strive to be an optimal option for kitchen renovations, it may not be the best choice for your unique situation. The fixed format, for example, limits the functionality of your space. If you are not a fan of where your cabinets are located, paying to remodel them will not help beyond aesthetic benefits. If your cabinets are in poor condition, it may not be worth the investment in the long run. 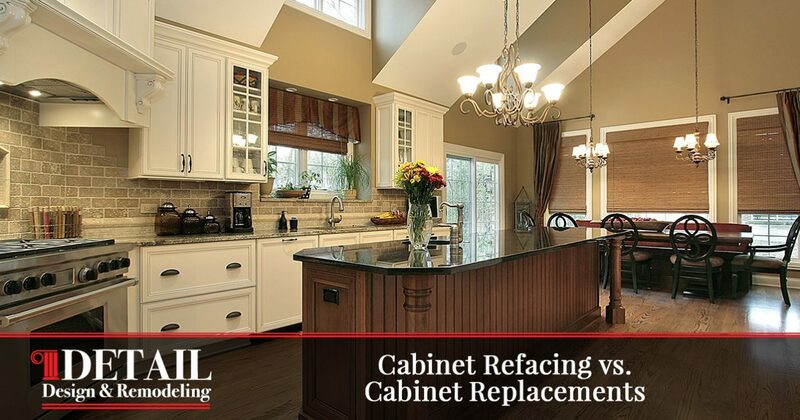 Choosing between replacement your cabinets and refacing them can be a tough choice, as each provides its own benefits and drawbacks. Detail Design & Remodeling is here to provide comprehensive cabinet refacing to Atlanta customers, breathing new life into kitchens with a process that is now more popular than ever. Our home remodeling contractors have experience in a wide range of kitchen renovations, and we’re ready to help beautify your home. Contact us today to learn more or to receive a quote on your upcoming project!